Alara's five shards are one again, igniting new magics and mayhem. It's all as Nicol Bolas planned. But can he be stopped before this plane is destroyed? The five shards of Alara were separate worlds for centuries, each one flowing with only three colors of mana. Their worlds and cultures evolved independently: Bant, an orderly, sunlit kingdom; Esper, a hegemony of wizards and sphinxes; Grixis, an undead-infested hellscape; Jund, a primordial hunting-ground ruled by dragons; and Naya, a lush jungle paradise. But now they have converged into one, and the rejoined plane flows with all five colors of mana once more. Waves of raw power crash across the former planar boundaries, bringing long-forgotten magics to all the shards and mingling them in unprecedented ways. As the boundaries between the shards dissolve, cultures clash and wars ensue. The forces of Esper invade the other shards looking for carmot, an element necessary to create more of their dwindling etherium. Hordes of Grixis undead mount an assault to maim, enslave, and drain the life energy from other shards. The warriors of Jund extend their "life hunts" to the newfound game throughout Alara's vast hunting grounds. Naya's forces follow the elves' decrees and march out of the jungle, searching for answers to the Anima's prophetic visions. And the armies of Bant clash with the horrors swarming over their borders, defending their homeland in the name of their guardian angels. At each front, the shards' legions pummel one another with powerful magics, calling on every spell they know to defeat the other shards. Nicol Bolas, the ancient dragon Planeswalker, planned this all along. He came to Alara to feed on its rich mana and, in one massive ritual, restore its lost power as part of his multiplanar plan. Only a fellow Planeswalker has hope of discovering his schemes—but even a Planeswalker would likely die trying to stop him. Alara has become a single plane once more. The Esper shard of Alara strives to augment all living things with etherium, an aether-infused alloy. Esperites believed the etherium supply was finite. But, while exploring Jund, Breya discovered carmot, the red stone necessary to create etherium. Breya replaced most of her body with etherium she created. Then her etherium was influenced by the wild magic of Jund and she gained powerful abilities. An ogre from the Grixis shard of Alara, Yidris was afflicted with unstable mutations that threatened to shatter his mind. No magic could relieve his curse. After Grixis collided with the other shards during the Conflux, knights from Bant drove Yidris into a volatile storm of raw mana. The unpredictable power of this Maelstrom stabilized his mutations and made Yidris a conduit for its own chaos. In the predator-filled land of Jund, Karrthus was the mightiest there was. Admired by Sarkhan Vol, Karrthus was captured by Nicol Bolas and forced into servitude. This desecration of Karrthus's power planted a seed of dissatisfaction Sarkhan, who started questioning his own commitment to Bolas. This minion to Nicol Bolas helped orchestrate the great conflux. Malfegor later led the forces of Grixis in destroying much of Esper—until those forces began spilling into Bant, where he was slain by Elspeth Tirel’s army. Rakka Mar is a shaman highly skilled at manipulating fire and rage. During Sarkhan Vol's stay on Jund, Rakka Mar became impressed by Sarkhan’s combat prowess and survival instincts, resulting in a fated introduction to Rakka’s master, Nicol Bolas. A powerful shaman and leader of all the Cylian elves on Naya, Mayael is still young by elven standards. After communing with the soul of the world, she became devoted to amassing an army to defend Naya from an imminent dragon invasion of the Jund. The soul of the Alara plane, Progenitus took the form of a massive five-headed hydra. But when the original splitting of the shards severed the connection to blue and black on Naya, Progenitus fell into a deep slumber. Only when the conflux occurred, reuniting Alara, did he awake. 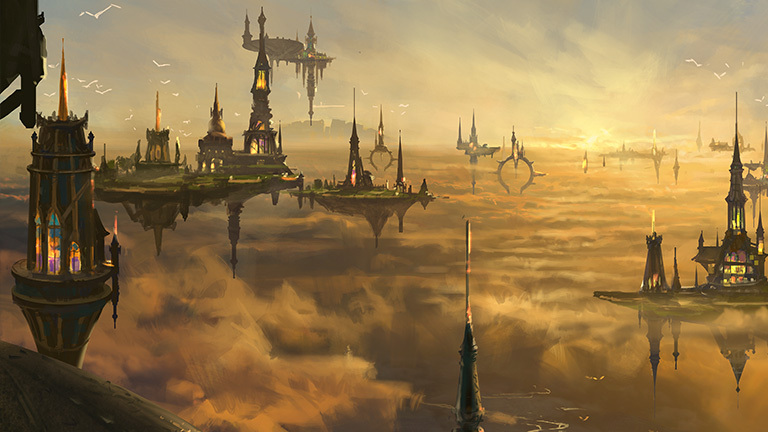 Honorable to a fault, the humans of Bant build massive castles and pristine marvels of architectural beauty. Conflicts on Bant are resolved by single combat, with each side choosing a champion to fight for them. Cold metallic perfection defines all things in Esper. Humans here strive to join the Seekers of Carmot on their quest to unlock the secrets of etherium. Once the rare element can be supplied in mass, they hope to finally achieve their goal: creating the perfect etherium-augmented beings. Surrounded by demons and horrors of all kinds, humans are hunted mercilessly on Grixis. Amid the stagnant life energy permeating the plane, humans are only able to stay alive by keeping one step ahead of their pursuers and relying on pure inventiveness. On Jund, only the strongest survive—and none are stronger then the primal dragons that number in the thousands. Humans on Jund persist by hunting together. The hunter with the most kills leads the tribe in battle as well as all other matters of community. Humans on Naya band together to track, hunt, and work in harmony with the massive beasts of the forest. Acknowledging the beasts’ power and capacity for widespread destruction, humans have learned to herd them away from their encampments… or into enemy territory. With their calculated thinking and level heads, the vedalken often rise to lead the Seekers of Carmot, directing them to search for ever more etherium. Under the care and advice of the vedalken, Esper was transformed piece by piece into the perfection only achieved through etherium augmentation. Forced to not waste a scrap of life, there is little that dies in Grixis that is not animated by a necromancer seeking power and security. Within this stagnant lifelessness, zombies roam a raw, flesh-soaked landscape. The dragons of Jund are massive, majestic creatures. They rule the land fully knowing their position at the top of the food chain—and they take every opportunity to reinforce that fact to any other creatures that dare cross them. Goblins survive on Jund by sheer force of numbers and accepting their low position on the food chain. This acceptance has led to huge ceremonies, where goblins willingly offer up one of their own as a tasty sacrifice to appease the mighty dragons. The leonin hunt Naya’s massive beasts for sustenance. Planeswalker Ajani is one of their own, though an outcast for his white albino fur. After his fight with Nicol Bolas, Ajani returned to his pride with a renewed sense of authority, becoming their leader. The elves of Naya live in harmony with nature and the many gargantuan beasts that surround them. They follow the visions of their current anima, Mayael, whose guidance helps ensure their survival. This artificer’s body is enhanced by the magical alloy etherium. Enslaved by one Planeswalker and mind-wasted by another, he continues to seek perfection of body and mind. Conflux heralds a tumultuous new environment: all five shards of Alara have begun to overlap and collide! Mayhem runs rampant, but with Basic Landcycling and Domain, you can make the anarchy work for you—and obliterate your enemies. The first-ever 100% multicolored Magic set! Nicol Bolas's violent plans have reached their cataclysmic culmination, and now all five shards have reconverged, resulting in unspeakable chaos and power. To live another day, you'll need to master this grotesquely unified plane.